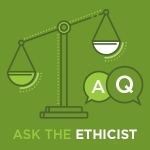 Apra : Blogs : Ask the Ethicist: Is Sharing Caring? I need your help! I recently started working for a new organization and, in the latest strategy meeting, I saw the name of a major gift prospect who was a principal gift donor (millions and millions given!) at my prior employer – am I allowed to share what I know about this prospect from what I learned at my prior organization? In your new position, you have to re-do the research using the tools you have access to at your current organization. Furthermore, this new research should also be within the context of the prospect’s connection to and interests in your current organization’s mission. Apra’s Statement of Ethics addresses this by stating prospect research reports should be used as internal documents only and are not intended for public distribution or for publication. The AFP (Association of Fundraising Professionals) Code of Ethical Standards addresses this by stating that members shall protect the confidentiality of all privileged information relating to the provider/client relationships. These standards apply to consultants, as well; if the same prospect or donor is on lists at different clients’ organizations, they can’t share information between their clients. Any chance your organization is considering hiring a candidate from a financial services company because they know many of your high-level prospects or donors? That’s also a big no-no because the same rules apply: Information on their clients is proprietary and can’t be shared outside that firm. Bottom line: You can’t “unknow” what you know, but you have to know what you know in the context of your current organization.